Recently I posted a TED Talks by Meg Jay where she debunks the cliche that nothing really matters until you hit age 30, in the aptly named “30 is not the new 20.” I also reflected on lessons learned through my twenties on my 29th birthday just a few weeks ago. Since this “defining decade” is now completely encompassed by the millennial generation, I was thrilled to discover that a few secrets have gotten out on how to gain perspective during the ambiguous, exciting and terrifying decade that is your twenties. Well, 101 secrets actually. 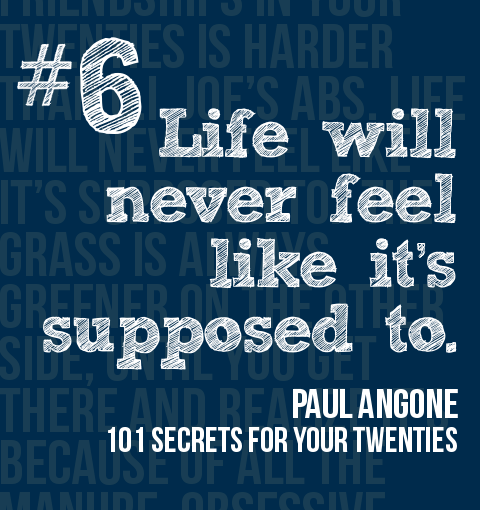 I read the book 101 Secrets to Your Twenties that just came out July 1st, by author Paul Angone. It’s a simple concept, and a fantastic read. 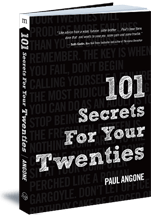 Angone sifts through many of the hard realities of living through this decade, and brings to a crescendo what many people in this age group already sense: you can’t sleep through your twenties. He does the hard work of defining the struggles and disillusionment, as well as the joys and benefits of this decade in what I agree to be a bona fide “black book of secrets” to navigate your way through emerging adulthood. I know this sounds negative, but it’s actually sweet relief. In my early twenties I felt like I was always vaguely yet aggressively looking for the “supposed to’s” in life. But I never seemed to find it perfectly. Luckily you will learn that there is no “supposed to,” and that fact is what will make your life awesome. You won’t make your life what it’s supposed to be, but what you want it to be. Apparently, that is allowed. This is such a Millennial thing. Seriously, what is our deal? 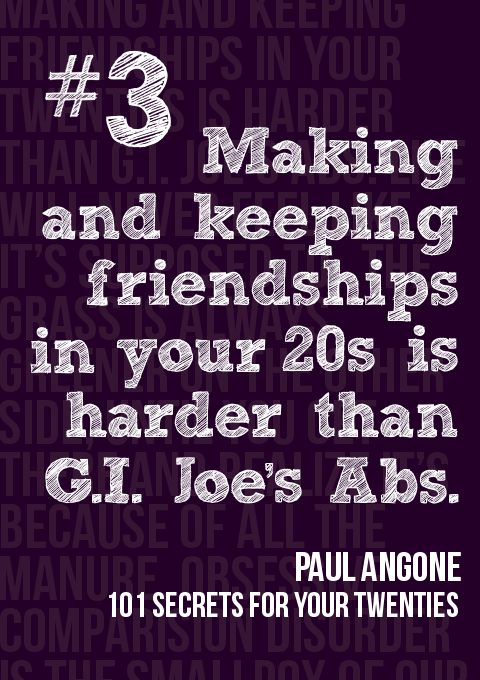 I’m glad Paul Angone highlights this trend, because it’s a Millennial curse that needs to be reckoned with. Breathe in, breath out. And sign out of Facebook. Yep. I laughed out loud while reading this “secret” because it’s exactly what happened to me. I’m glad to see I wasn’t alone in this! Cubicle + weekly potlucks + vending machine = realization you do not have the metabolism of a teenager anymore. 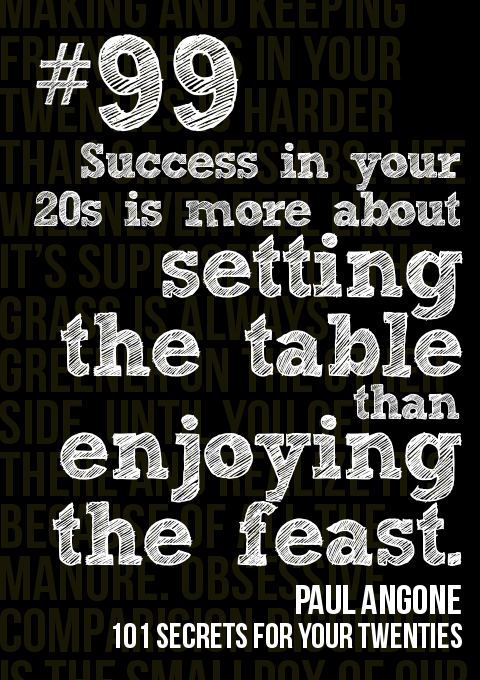 This is a great anchor to summing up what your 20s are about. Enjoy them, hate them, but make sure to fully experience them, because around my age (29!) you realize that if you’ve done them well, it’s just the beginning of your awesome life. Really. Yearbook pic from Sophomore year of college. Age 19, right before the “defining decade” 🙂 Keep your hat on for the crazy ride, lady! Actually I think I lost that hat a decade ago. Gah!! + At times you will be perceived as a stereotypical twentysomething, so just take in stride, and take it as an opportunity to prove them wrong. Oh, and learn what the negative stereotypes are, and DON”T be them. + Your twenties are about sorting out the bad junk you’re carrying around, so there is no shame in getting counseling or therapy for a while. There’s only so much you can vent on your Facebook status or your cubicle mate. This is a great book to read if you’re right smack in the middle of your twenties, or even if you’re a tad past your twenties and are like “what just happened?” It’s also great for college kids (and even their parents) to help them get a grasp on some of the challenges and changes they are about to experience. The only pang of regret I have is that this book was released right as I reached age 29. But the “secrets” resonate with me. They ring true. I learned many, if not all 101 of them. They made me laugh, and made me realize that I’m not alone in what I’ve experienced. I love your #2 (Paul’s #6). It’s so true! I feel like every 20-something should have that posted where they can see if everyday. It’s something that us Borderline Adults talk about a lot. Oh my god. I’ve bene trying to decide what my next book will be and I’ve heard about this book but wasn’t quite sure if it was for me. #3, #6 and #35 just sealed the deal for me. These are my current and biggest struggles that I deal with DAILY. I know it’s not healthy to compare to others especially at this age when everyone is doing something completely different. I have friends who are getting married, friends who are single, friends who are unemployed and friends who are climbing the ladder at their current job, friends who live at home and friends out on their own in NYC. 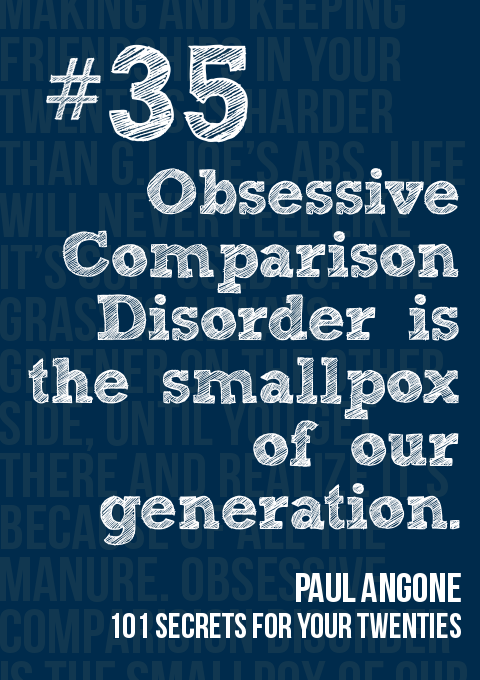 Nothing is ordinary, but as much as I try to remind myself of this I still find myself drawing comparisons. I had a conversation with a friend when I was about 25 about how we realized it was useless to compare our lives, and our friends lives to each other. I was working part -time married, and pregnant. She was jumping headfirst into a great career, single, and traveling all the time. Other friends were on like their 2nd or 3rd child. Some were in the process of divorce, or going to grad school. We realized the directions were endless at that age, and you really have to give it time. It’s still hard to not compare, but you start to take the comparisons less seriously. It’s a great book, I recommend it. There are more good points in it that will make you feel like you’re not alone, or weird on your journey as a 20something.